Minit review — Kelleher Bros.
Look out, here comes another indie darling for Nintendo Switch! Minit is a bite-sized adventure game with a topdown view and monochromatic pixelated art style. The overall look is fairly reminiscent of a Zelda game on the original Game Boy. 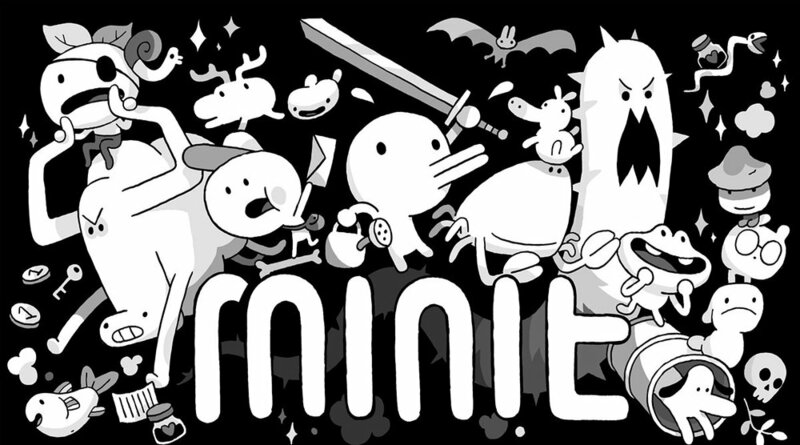 Designed by a four-person team—Jan Willem Nijman, Kitty Calis, Jukio Kallio (composer), and Dominik Johann—Minit was published by Devolver Digital, who really seems to be killing it these days! The game’s main gimmick is that you die every 60 seconds. You explore this quaint little seaside world, all the while an onscreen timer ticks away one second at a time, the clock creeping closer and closer to your inevitable death. In that way it’s basically like real life, only briefer. After picking up a sword on the beach, our hero is informed that the weapon is cursed and must be returned to the factory from which it came. Thus your hero’s journey begins…and is cut tragically short after 60 seconds…but after waking up back in your home, it begins again…only last another minute before death catches up…and you awake in your again to begin the quest anew…. And so on, and so on…. In order to make exploration and progression possible under such extreme time constraints, all upgrades in Minit are persistent. This means the game will save any items you acquire on your quest, so each time you awake in your house, you’ll have all the tools you’ve collected up to that point at your disposal. The tools, of course, enable you to access more of the map, and there are some fun inclusions. There’s a Watering Can which allows you grow plants, and also put out fires. There’s Coffee which gives you the energy/strength to push boxes. A catchers mitt-looking “SwordThrower” allows you to toss your sword a short distance and have it boomerang back. Coins are also hidden throughout the game and can be used to purchase other items, such as the FastShoes. Speaking of restarting from your house, your home base/starting point can also be switched to other locations that you manage to wander inside of. For example, a peaceful island cabin, a tailer by the desert, or a slightly rundown hotel. 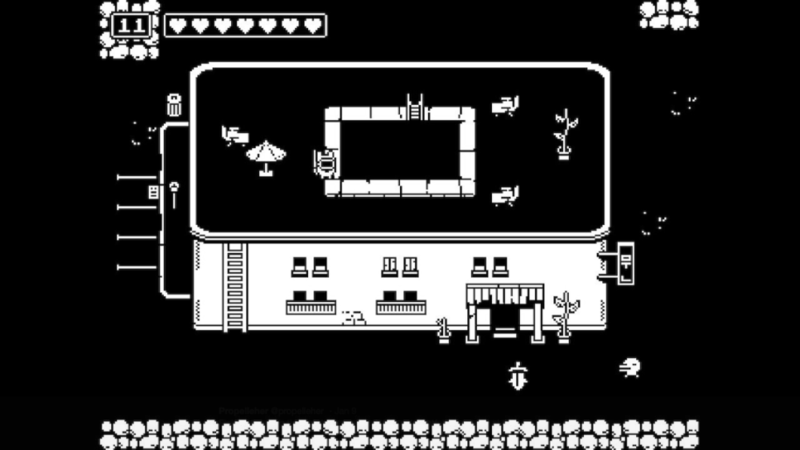 Overall, Minit feels oddly reminiscent of Zelda: Link’s Awakening on the original Game Boy. You explore an island (or this a seaside village?) filled with quirky characters, presented in black & white pixelated art, and accompanied by catchy chiptune music. Speaking of the music, it’s probably my favorite element of the game. The soundtrack, while appropriately diminutive for a game of this scale, is incredibly catchy. The bouncy retro vibe of each track really adds to the overall experience. In terms of art style though, this game doesn’t actually resemble Link’s Awakening all that much. The protagonist of Minit, for instance, looks very much like an old Tamagotchi sprite, which I assume is intentional. One character might look like a rabbit, while another might appear to be turtle, and many others look like more Tamagotchi. It actually makes me wonder if the designers conceived of this world as being the place where Tamagotchis live out there rest of their lives, years after being raised as pets in the egg-shaped portable devices from our childhoods. Minit’s dialogue, and the overall sense of humor, is rather excellent—funny and genuinely unique. If you like this style of topdown exploration/action RPG gameplay then you’re probably already sold on this one. If not, the charming storytelling and cleverness on display might win you over. It seems to me though, that this game’s target audience is most likely speedrunners. Minit’s design is so perfect for speedruns, it almost feels like a gateway drug. If you’re looking to break some records, this game feels like a great place to get your feet wet. My first time through, Minit took me an hour and a half to finish. And apparently I didn’t find a good portion of the secrets because it said I was only 60% complete. If you really knew what you were doing, I’m sure you could beat the game in under 30 minutes. While that might sound awfully short to some players, it can also be quite a relief to others. After completing the game you unlock a new game+ mode, which sounded cool. I hoped that Minit had a remixed second quest, kind of like the original Legend of Zelda. As it turns out though, new game plus+ appears to merely be a Hard mode, giving you 40 seconds at a time instead of 60. Personally, I don’t plan on tackling the added challenge. Fun and charming as it is, Minit might not be a surefire hit for everyone—at least not with its $10 price tag. An adventure this short and sweet would be a total steal at five bucks, but ten might be a bit too steep for the more causal crowd. It certainly is a great game however, well worth your time. So if you see it on sale, I definitely recommend grabbing yourself a copy.